Fire Engine Pump Discharge Pressure (PDP) is the pressure set at the pump to achieve the desired pressure at the nozzle furthest from the pump (while considering the change in elevation and friction loss). Having a good understanding of pump discharge pressure is essential to becoming an effective fire engine operator. Learning these principals will help you with much more than calculating the correct pressure at the nozzle. Understanding Pump Discharge Pressure will also help you gain a big picture understanding of fireline safety and hydrodynamics (fluids in motion). In our example we will use a wildland firefighting example. All the calculations work the same for structure fires, vehicle fires and wildfires. Progressive hose-lay - The process of deploying both a supply line and attack lines around a fire to stop it's spread. Supply Line - A larger diameter hose that provides a higher volume (GPM) of water at a lower friction loss. Wildfire supply lines deployed around a fire are typically 1.5" (attack lines are typically 1"). Attack Line - A smaller diameter hose typically used to supply water to one nozzle. On wildland fires, firefighters typically use a 1" fire hose with a combination nozzle. The 1" hose is usually small enough to move around and large enough to knock down the fire. Gated Wye - A 1.5" appliance that divides a female threaded inlet coupling into two male gated discharge outlets. Reducer - An appliance adapter that reduces the hose diameter from 1.5" to 1". Inline T - a "T" shaped appliance with a 1.5" female threaded inlet and a 1.5" male threaded outlet. On one side of the inline T there is a 1" outlet with a valve used to turn the 1" hose on and off. Hardware - Term used to describe a wide variety firefighting devices (Valves, increasers, reducers, etc). <Learn more about hardware and friction loss. Elevation Gain or Drop - Water pumped uphill takes more energy than on flat land. Water pumped downhill takes less. PDP (Pump Discharge Pressure) - The pressure set at the fire engine in order to get the optimal pressure for a specific nozzle. 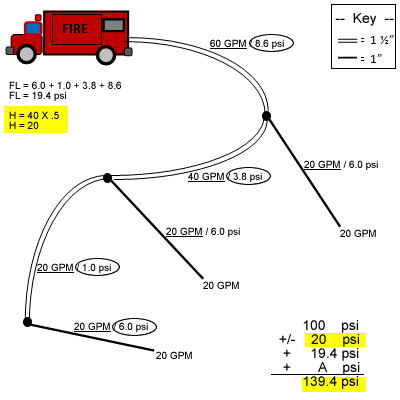 NP (Nozzle Pressure) - In this example, assumed combination nozzles have a 20gpm output. H (head) - The number of feet elevation gain/loss divided by 2 = PSI gain or drop. 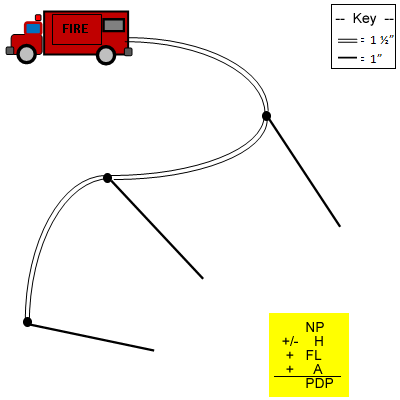 FL (Friction loss) - The amount of PSI drop between the fire engine and the nozzle(s) cause by friction between the water and hose/appliances. Your crew has just deployed 3 Hose Packs on a small brush fire. Each hose pack has one 100 ft 1 ½” supply line, one 100 ft 1” attack line, one 1 ½” Gated Wye, one 1 ½” to 1" reducer, and one 10-20 GPM combination nozzle. Assume that all nozzles are flowing at 20 GPM and the fire is burning atop a small hill (40 feet above the fire engine). Objective: Determine the proper Pump Discharge Pressure for nozzle with the highest friction loss. NP +/- H + FL + A = PDP Provide enough space on the right side of formula to enter numbers and perform calculations. Add 100 psi as NP in the Pump Discharge Pressure formula. Most combination nozzles are rated at 100 psi. Use 100 psi for this problem. Use the picture to determine the GPM passing through each section of hose, enter it beside each section of hose, and underline that number. Use a Friction Loss Calculator to determine the Friction loss for each section of hose. 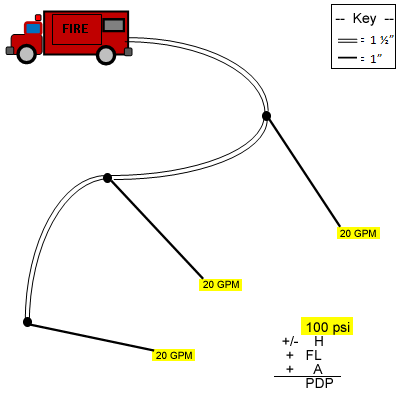 Enter the friction loss calculation to the right each hose's GPM. Find the path from the fire engine to the nozzle with the highest friction loss. 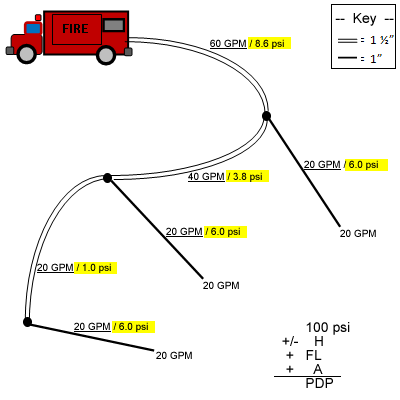 Circle each of the PSI friction loss values for every hose in that path. Add up those values (19.4 psi) and enter the sum as A in the Pump Discharge Pressure formula. Step 7 - Appliance Friction Loss. Each organization has their own procedures for determining Friction Loss. I am not going to tell you what is right or wrong on this example. Ask your trainer or supervisor how they want you calculate hardware friction loss. Add each appliance's friciton loss in the path PDP you are calculating and enter appliance friciton loss as "A" in the PDP formula. Keep in mind, hose-lay hardware usually accounts for a very small percentage of friction loss on a hose-lay and no two types of hardware have the same friction loss. Many organizations chose to leave hardware out of the Pump Discharge Pressure calculations (which is easiest). Others will sometimes add 5psi loss for each appliance (gated wye & reducer or inline t) the water passes through. You can learn more about Hardware Friction Loss. Step 8 - Head Pressure & Calculate Total. Add NP, H, FL, and A to get the Pump Discharge Pressure (139.4 psi). Enter 139.4 into your formula. Once you've determined the friction loss you should also think about safety. Look at the pressure (PSI) on the hoses with the highest friction loss to determine if it exceeds the maximum rating of the hose (300 psi when tested annually). For example, if you have 600 ft of 1" hose pumping 40 gpm, there is 144 psi friction loss, add the 100 psi nozzle pressure, 80 ft elevation (add 40 psi head pressure) and you are at 288 psi (without considering hardware). Warn firefighters that nozzles near the pump may have an extremely high pressure. 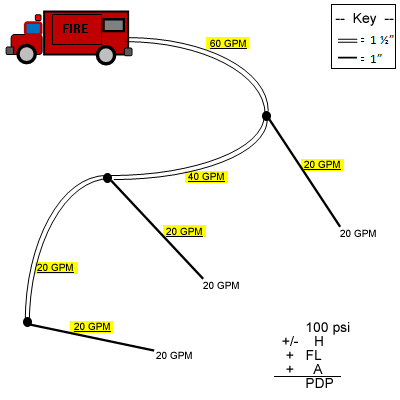 In the example above, if you add a second 100 ft section of 1" hose hooked directly to the fire engine (pumpking at 288 psi), it will have a nozzle pressure over 200psi. Hose with high pressure is more ridged/fragile and should be handled more gently. Has your hose been tested in the last 12 months? NFPA 1962 - Fire hose should be tested annually. Attack fire hose shall be service tested to a minimum of 300 pounds per square inch (psi). Many fire departments don't test to this standard or are not aware of the recent minimum increase from 250 psi to 300psi. How do you know if some or all nozzles are turned on or off? If your pump shows output GPM, it is important to monitor water usage (for many reasons). Actual water usage is much more accurate than theoretical usage drawn on paper. But, typically you're not be able to see which nozzles are on or off. The nozzles furthest from the fire engine are often the only ones being used (to work around the fire's edge) and the other nozzles are only used periodically if the fire flares up after the first pass. If you don't have a GPM output gauge, firefighters will tell you if the pressure is too high or too low by radio or hand signals. If the water is turned off you need to consider cavitation of your pump. Pump discharge pressure is rarely calculated in the field. Learning how to set Pump Discharge Pressure is better learned & reviewed in training to gain a good understanding that you take to the field. Most fire departments and fire engines have a standard operating procedure (SOP) to attack a fire. Create a list based on your SOP and determine if there are common situations where your combination of hose, hardware, elevation change & nozzle pressure, where you will likely run into trouble with adequate pressure or excessive pressure. These are the situations you should know and share with your crew. If everyone has a short list of hazardous situation to look out for, if an inexperience firefighter must run the pump, they will be able to do so with a higher degree of safety due to this preperation. Be ready to calculate PDP in the field if a unique situation occurs. Ex: You need to pump water down a 600 ft mountain. In this situation would you know what to do? The Friction Loss Tables ( 3/4", 1", 1 1/4", 1 1/2", 1 3/4", 2", 2 1/2" , 3" , 3 1/2" , 4" , 4 1/2", 5" & 6") (by FireDepartment.net) are free to print and the easiest method to determine friction loss. The Friction Loss Calculator is also free and easy to use. But, it is requires you to have a device with internet access or downloaded an app. The Friction Loss Slide Rule starts at ~$20, have a high probability for human error and (assuming the same formula is used) the slide rule is the least accurate of the four methods listed. The Friction Loss Formula is also free to use. But, this method takes the most time, uses somewhat complex mathematics, and due to complexity has a very high probability of human error.